Stockton— “Educational Workshops about credit and debt in our community will benefit our residents,” said Rosalinda Galaviz, Community Advocate in South Stockton. During the morning of March 8th, —at the Kennedy Center located on Southeast Stockton— Housing and Economic Rights Advocates and local Officials released information of a new monthly workshop series aim to educate local residents about mortgage and debt collection issues. “We’re excited to be bringing more of our energy and focus into the Valley, and we’re starting with San Joaquin County,” said Maeve Elise Brown, Executive Director of HERA. San Joaquin County Officials praised the plan, “I think HERA can help fulfill a need,” highlighted San Joaquin County Deputy District Attorney, James Lewis as he acknowledge underserved residents in the community. Monica Hernandez is looking forward to the information because, “my ex-husband has drown my credit.” Hernandez has been looking for help on reestablishing her credit as she would like to become a homeowner in a near future. The series is underwritten by a grant from San Francisco-based van Löben Sels/RembeRock Foundation and the presenters will be offered by the Oakland based, Housing and Economic Rights Advocates. HERA is a not-for-profit legal service and advocacy organization dedicated to helping California residents —particularly those most vulnerable. The organization has been building a safe, sound financial future, free of discrimination and economic abuses, in all aspects of household financial concerns. The San Joaquin County Human Services Agency and HERA are working together in elaborating the workshops and legal clinics calendar which will soon be published. Anyone may obtain more information about the workshops by contacting Erté Boyette, Community Program Manager at (209) 468-1549 or by contacting HERA at (510) 271-8443. 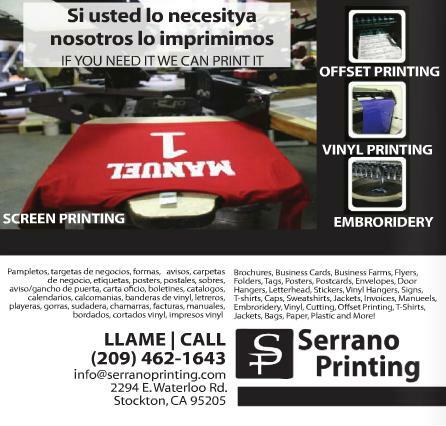 Bilingual Weekly (BW News) – Your source of Local news covering topics of Latino interest in Stockton, California; and San Joaquin County. STOCKTON — On Wednesday January 6th, More than 250 business owners and corporate representatives gathered at the University of the Pacific’s DelaRosa University Center to learn at the 2016 Business Forecast Conference. The Conference organized by the San Joaquin County Hispanic Chamber of Commerce offered four speakers with different insight to 2016’s economic outlook. 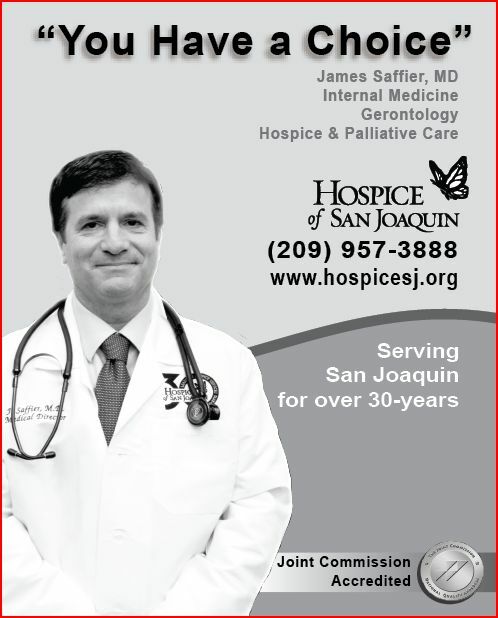 Jeffrey Michael, Director of the Center for Business and Policy Research at University of the Pacific projected that San Joaquin’s prospects may be brighter than the rest of the nation expects the 3.4 percent job growth of San Joaquin to reach 3.7 percent in 2016. “Stockton is the 4th in job growth in California; Stockton is doing better thank Sacramento,” highlighted Michael. However, Bob Gutierrez, Director of Government Affairs for Food 4 Less, and the Hispanic Chamber’s President Elect, highlighted a list of State laws which that will increase business regulation and cost. 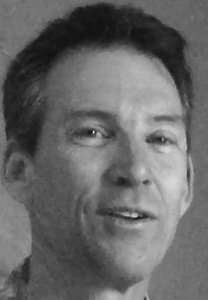 Scott Anderson, Chief Economist of Bank of the West, projects throughout that, “education, health, professional services, and transportation” are among the industries to excel in the upcoming months. Michael projects gains in the construction industry as it has been recovering from the 1,000’s during the recession to last year’s 1,700 dwelling and projected to be at 2,200 new units in 2016. The San Joaquin County Office of Education (SJCOE) Teachers College of San Joaquin (TCSJ) announces that enrollment is open for the new Transitional Kindergarten (TK) Certificate Program that will allow teachers to meet new requirements for teachers following the Kindergarten Readiness Act. Under a recent change to state law, teachers first assigned to a TK classroom after July 1, 2015, must complete 24 units in child development by Aug. 1, 2020. Recognizing the need, TCSJ developed a program allowing teachers to complete those units while also giving them the option to pursue other educational and professional goals through programs already offered at the college. “We have worked hard to make the program attractive to a variety of teachers by developing it in such a way that teachers are able to choose multiple pathways, including the pursuit of a Master’s Degree,” said Kimberly Ott, a program developer and SJCOE coordinator of TK support services. The new certificate requirement comes from Senate Bill 876. The law follows the Kindergarten Readiness Act, which made one year of voluntary, high-quality TK available to every 4-year-old in California to ready them for success in school. For more information about the TK Certificate Program at TCSJ call (209) 468-4926 or visit: teacherscollegesj.edu. Teachers College of San Joaquin: Founded in 2009 by the San Joaquin County Office of Education (SJCOE), Teachers College of San Joaquin (TCSJ) is the first WASC accredited institution to be housed within a county office of education and serves graduate students from across Northern California, including teachers and administrators who come from both elementary and high school settings. This year, TCSJ has over 1,000 students enrolled, including new TK teachers. BW News – Your source of Local news covering topics of Latino interest in Stockton, California; and San Joaquin County. State of California — The Department of Industrial Relations (DIR) reminds California’s employers and workers that effective January 1, 2016, the state’s minimum wage will increase to $10 per hour. “This increase in the minimum wage is California’s second increase in 18 months. Those earning minimum wage will now have a bit more to take home every paycheck,” said Labor Commissioner Julie Su. The Labor Commissioner’s Office is a division of DIR. Governor Jerry Brown signed legislation on September 25, 2013, raising California’s minimum wage to $9 per hour on July 1, 2014, with a final adjustment to $10 per hour on January 1, 2016. It marked the first increase in California’s hourly minimum since 2008, when the minimum wage was raised 50 cents to $8. State law requires employers to post information on wages, hours and working conditions at a worksite area accessible to employees. Notices for the wage orders in English and Spanish can be downloaded and printed from the Workplace postings page on the DIR website. Almost all employees in California must be paid the minimum wage as required by state law. Workers who are paid less than the minimum wage may file a wage claim with the Labor Commissioner’s office. DIR protects and improves the health, safety and economic well-being of over 18 million wage earners, and helps their employers comply with state labor laws. DIR’s Division of Labor Standards Enforcement (DLSE), also known as the Labor Commissioner’s Office, enforces prevailing wage rates and apprenticeship standards in public works projects, inspects workplaces for wage and hour violations, adjudicates wage claims, investigates retaliation complaints, issues licenses and registrations for businesses and educates the public on labor laws. Employees with work-related questions or complaints may contact DIR’s Call Center in English or Spanish at 844-LABOR-DIR (844-522-6734). The California Workers’ Information line at 866-924-9757 provides recorded information in English and Spanish on a variety of work-related topics. SACRAMENTO – State Controller John Chiang today released his monthly report covering California’s cash balance, receipts and disbursements in October 2012, showing that total revenues were $207.9 million above (4.4 percent) projections contained in the 2012-13 State budget. Personal income taxes in the month of October rose $378.4 million above (10.6 percent) projections, while sales taxes also were up by $28.8 million (4.4 percent) relative to projections. Corporate taxes were down for the month, coming in $131.3 million below (47 percent) projections. The State ended the last fiscal year with a cash deficit of $9.6 billion. As of October 31, that cash deficit totaled $24.7 billion, and is being covered with $14.7 billion of internal borrowing (temporary loans from special funds), and $10 billion of external borrowing. For more details on today’s report, read October 2012’s financial statement and summary analysis. STOCKTON, CA- The new Stockton Walmart held its grand opening celebration on Wednesday, July 18 at the Spanos Park West shopping district in North Stockton. “It’s a great pleasure to be here today and welcome the Walmart family to Stockton,” said Stockton Mayor, Ann Johnston at the ceremony. In a time of financial difficulties for Stockton, having a new major retailer opening its doors will provide sales tax revenue for the city, added Stockton`s Mayor. Located in 10355 Trinity Parkway, the 212,000-square-foot store brings approximately 380 new jobs to the community. 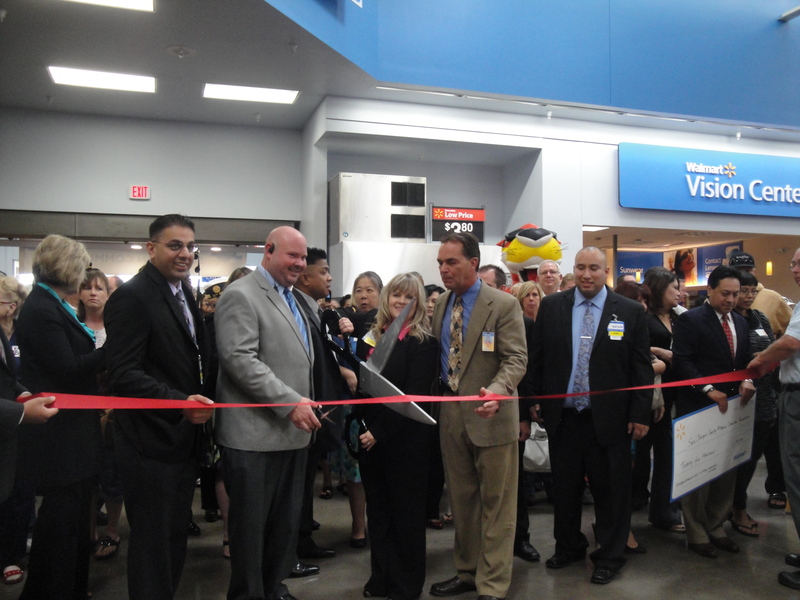 “I know firsthand of the quality of careers that you can have at Walmart,” said store manager, Larisa Lujan. However, the debate if Walmart is a poison or antidote for communities like Stockton continues. Many worry about the impact Walmart will have on small businesses, other say it will benefit local businesses as additional customers are attracted to the regional shopping area. Yet shoppers seem to like the “always low prices” and the 24/7 schedule offered by the world’s largest retailer. In fact, just before 8 a.m. some were already lined up outside the doors ready to shop. The Walmart Foundation presented a total of $33,000 in donation money to community organizations. “Walmart will be a great community partner with the area’s nonprofits and neighbors,” said Mark Martinez, CEO of the San Joaquin County Hispanic Chamber of Commerce (SJCHC). 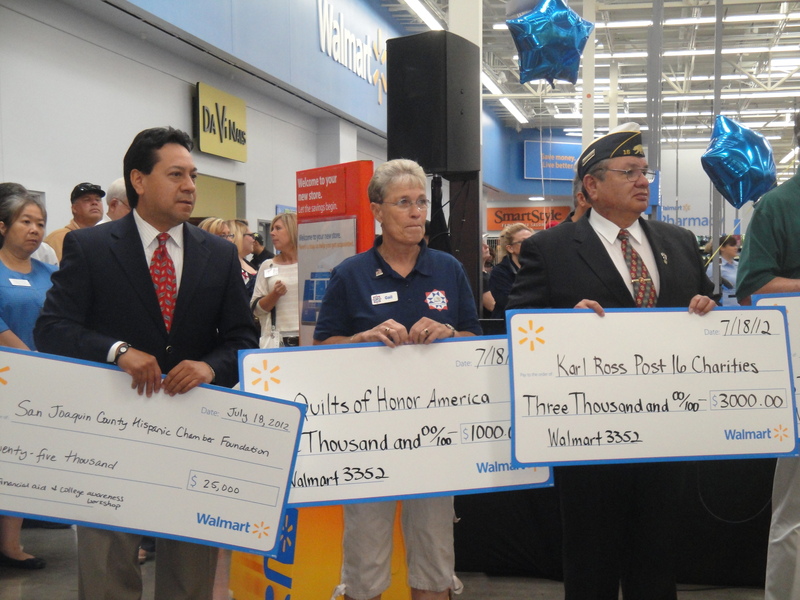 During Wednesday`s ribbon cutting ceremony, the Walmart Foundation presented a total of $33,000 in donation money to community organizations. $25, 0000 for the SJCHC Foundation and $8,000 among Stockton Emergency Food Bank, the Greater Yosemite Council Boy Scouts of America and United Way. “Just this year Walmart gave our Chamber a large grant to help fund our Student Financial Aid and College Awareness Workshop that will help families plan for higher education,” said Martinez. The Student Financial Aid Workshop is a partnership between the University of Pacific and Stockton Unified School District that hires SJCHC to coordinate volunteers that help students fill out FASFA forms.